Choosing furniture for your home can be one of the most exciting tasks of setting up house. There are so many options to choose from when it comes to furniture styles. Your furniture typically matches your personality, and reflects your taste. If you enjoy a casual lifestyle, you can put together casual furniture pieces to create a casual look and feel to match your tastes. If you are a casual personality-type and don't usually go for the shi-shi or fru-fru stuff, you are in luck. There are many types of casual furniture to choose from. You can furnish your bedrooms, family room, even your office, in casual furniture that is comfortable, practical, yet stylish and inviting. I never wanted anything too stuffy - that wasn't my personality. I have a child and she always has kids over, so I wanted my home to reflect a casual, yet inviting and tasteful atmosphere. After studying many styles of furniture, I went casual and have never looked back. It reflects who I am, and who we are as a family, yet is attractive, tasteful, as well as utilitarian. It's got everything, very user-friendly if you will! 1. Yes, you guessed it! 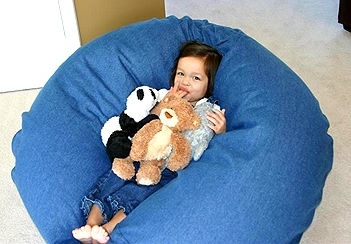 Bean bag chairs - Bean bag chairs are great for kids and are practically the definition of casual if you choose the right fabric. Denin is a great choice, since it will go just about anywhere and stand up to a lot of use from kids. Speaking of which, kids' rooms usually have a lot stuff with not a whole lot of room left over. Bean bag chairs don't take up a lot of space, and can be tossed in a corner to put them out of the way. Plus, they're soft and comfy so no worries about them throwing them around and hurting themselves or their siblings. Denim is a great casual fabric for a casual bean bag. 2. Area rugs - Bright, airy and colorful area rugs are a nice way to add to your casual environment. Find rugs that are easy maintenance and not heavy, materials or colors. You can even toss a few floor cushions around for quick, easy, extra seating. 3. Wicker - Wicker is a great, casual material that many people use for decorating casual environments. You will even find plenty of wicker in places like beach houses or in cozy sunrooms. In fact, beach houses and sunrooms are some of the most popular places to find casual decor. 4. Wrought Iron - Wrought iron is great for creating a casual, Tuscan look. You can find wrought iron pieces; such as, wine racks, kitchen tables and chairs, side tables, etc. in most furniture stores. It will lend a rustic feel to your room quickly and easily. 5. White Oak - Coffee table sets, kitchen tables, and even dining room tables are always a bit more casual in white oak. White oak is not as formal as dark cherry and gives a more casual look and feel to a room. You can even use white oak for your bedroom furniture. 6. Over-stuffed- Over stuffed chairs are a great way to get a casual look in your room. Big, over-stuffed furniture, like chairs are comfortable and give a room a more laid-back and relaxed look and feel. 7. Glass-Topped Tables - Glass-topped tables; such as for your family room, give your room a more casual and relaxed look and feel. Glass tables go with many types of decor, which makes it easy to choose furniture pieces, and mix and match. 8. Pub-Style Eat-In-Kitchen Tables - Taller kitchen tables, also know as pub-style, give a casual look to your kitchen. Not as formal as a regular height table, and you can choose to use tall bar stools for seating, or taller chairs. Not to mention the height is great for taller people! 9. Rattan Furniture - Rattan is similar to wicker furniture and has a very casual look to it. You can use it either outdoors or indoors. Popular rattan furniture is usually seen in tables, chairs, outdoor patio furniture, even bedroom furniture. 10. Bunk Beds - It's pretty much impossible to make a bunk bed formal or fancy. Not only practical for their intended purpose of allowing multiple sleepers, they double as forts and even storage (if the top bunk isn't being used, throw the stuffed animals and books up there!). These built-in bunk beds are awesome! You can create a more casual look to your home by choosing these types of furniture. Do you have a casual home? How did you decorate and furnish it? Please do share!